Need a Summer project?? 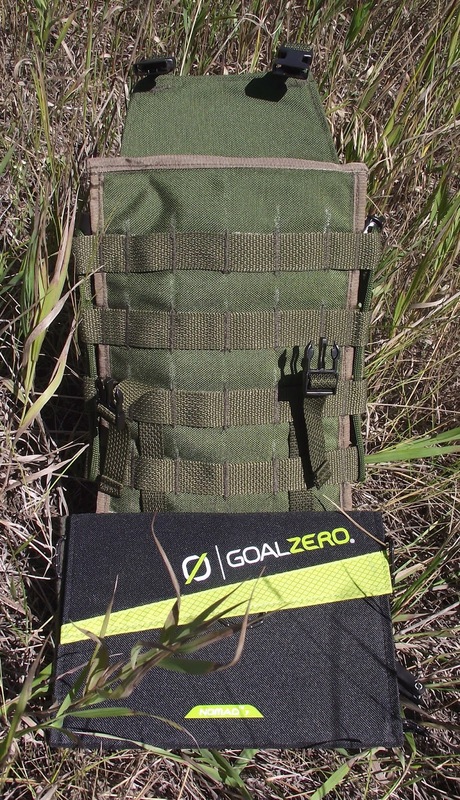 Happen to have a Goal Zero Nomad 7 Solar Panel set?? Not totally comfortable of just strapping the Nomad 7 on your pack and smashing off through the bush?? Well, today is your lucky day!! I have just designed and built a solution to protecting your Goal Zero investment. The Solar Gear Taco.....now, the taco gear pouch is not my idea exclusively, there are a few companies out there that build mag pouches and phone pouches that also use the taco design. The taco is recognized by the fact that there are no side panels to the pouch. 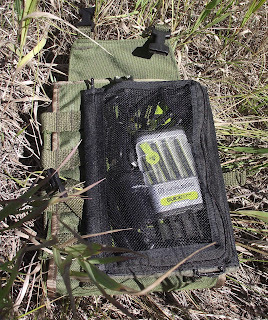 The pouch is held closed on the sides by bungie cord or para-cord that lace through loops down each side of the pouch. 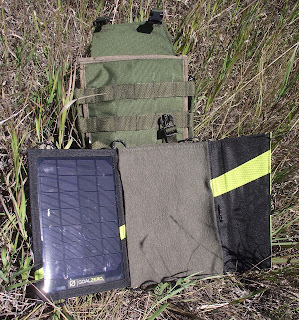 My Solar Gear Taco just happens to be sized to fit and work with the Goal Zero Nomad 7 Solar Panel Set. These solar panels are tough and weather resistant in their own right, but I cannot trust myself to remember I have breakable items strapped to my ruck.....thus, I needed to add another layer of protection. I like the taco design, because it speeds up construction and allows for custom sizing. So, let's have a look at this a bit closer. The Solar Gear Taco allows for straight forward design and construction, you are basically making a single padded panel.....now I wanted a bit more weatherproofing so I added a flap over the top, that could be omitted. 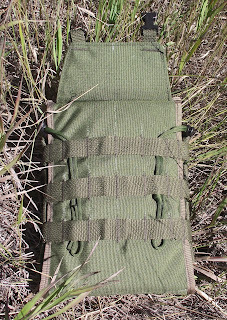 Also, I employed MOLLE styled webbing, front & rear, to enhance the loops needed for lacing the pouch together. 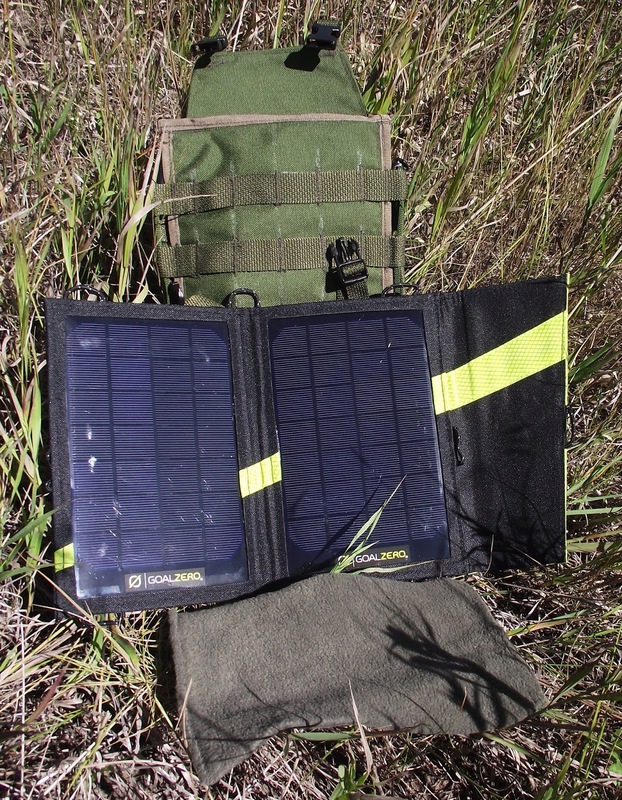 These MOLLE patches can have other pouches added to the Solar Taco, as well as, use MOLLE connectors to attach to a rucksack or other system using MOLLE. The overall size is 7 1/2" wide x 23" long (open size) + the flap. When laced together we maintain the 7 1/2" width but reduce the height to just over 10 1/2". Pretty compact. Seam Tape (3/4") +/- 60"
1) After cutting out all pieces, group together by purpose. 2) Attach 1" webbing to the outer fabric. 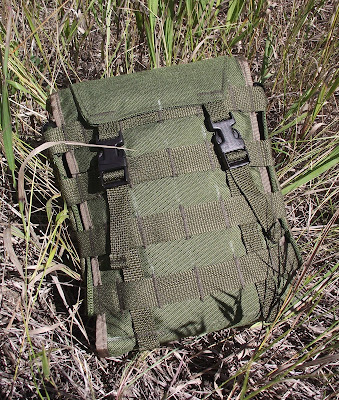 Webbing for MOLLE style patches.....front, start 2" down from the top of the front panel. Chalk lines every 2", you need 4 lines.Place webbing against the line, and this will leave the 1" spacing for the MOLLE to work. Starting at the centre, sew bartacks at 1.25" spacing working out from centre toward the side edges. 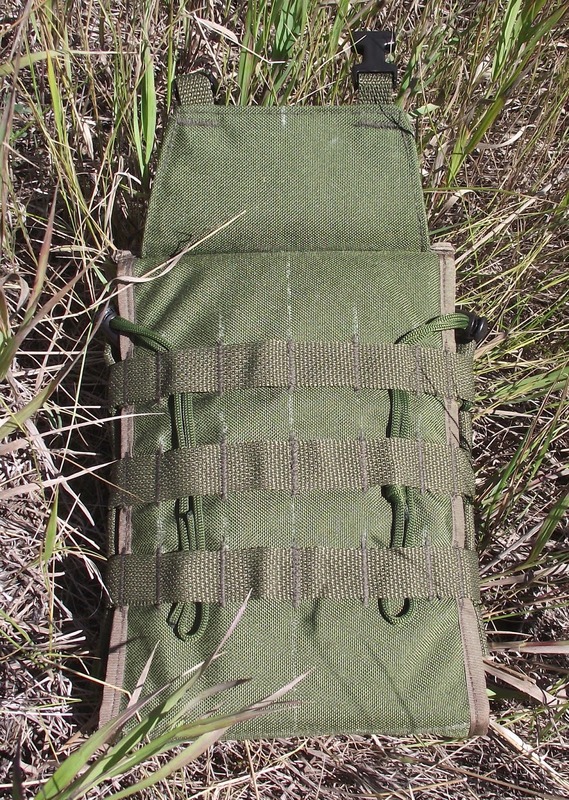 Rear MOLLE patch start 3" down from the top and chalk lines every 2", you need 3 lines. The end loops will get finished near the end of the project after the seam tape has finished the side seams. DO NOT sew the loops down before the seam tape....I only made that mistake once, oops. 3) Join the outer piece to the inner fabric - bad side to bad side. Sew down the right side seam using the edge of the sewing foot as your guide for seam allowance. Repeat with a zig-zag closer to the open edge. Finish by top stitching the seam tape in place. Avoid the tailends of webbing. 4) Measure down 10 1/2" from each end, chalk a line. Top stitch along this line. This should build a 2" pocket in the fabric panel across the short axis. Insert small piece of foam. 5) Repeat side seam process for the left side of the fabric panel. 6) Measure, cut and assemble the top flap. Tip: Mark the centre points. Measure from centre 7.5" on the lower edge and 5.5" on the upper edge. Chalk a line from the 5.5" to the 7.5" on each end, you should get a bevel angle. Cut out. Pin to second piece and cut to match. Assemble 3" piece of 3/4" webbing through female side of 3/4" side release buckle, fold webbing in half, if needed tack in place with a row of stitches. 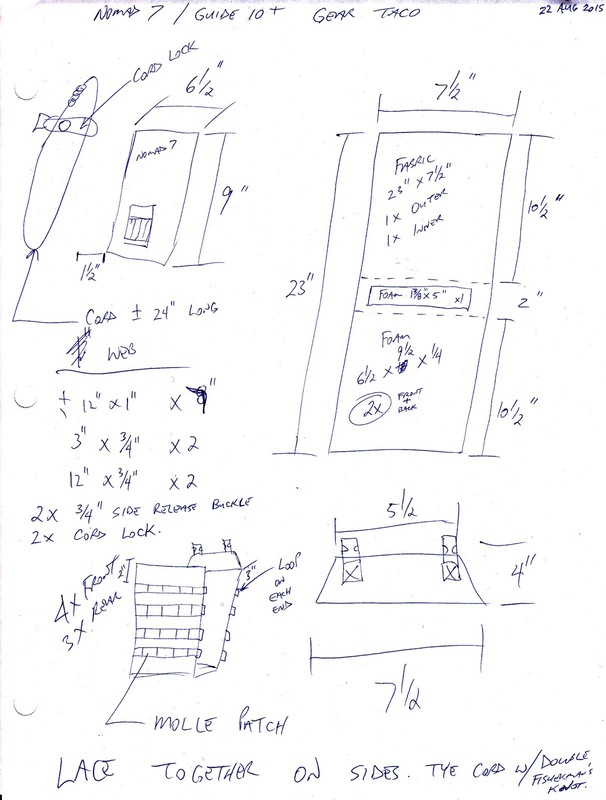 Layout fabric pieces goodside to goodside, insert buckles with webbing tail extending beyond the top of the fabric. Sew around the edges of the fabric piece, keeping the buckles as straight as possible. repeat around the edge with a zigzag stitch. Invert, so badsides are to badsides, top stitch around edge. Bartack over the webbing tails. 7) Insert large foam pieces. Top stitch the openings closed. Zigzag. On the top of front panel finish with seam tape. The rear panel add the flap and then finish with the seam tape. 8) Bartack 1" webbing ends into loops. Sew through the seam tape on the sides of the panel. 9) Next attach the 3/4" webbing (12") by top stitching at the seam 10.5" down from the top. Line up the webbing so it will lace up through the MOLLE patch. Weave the webbing through the 3/4" side release buckle - male end. Fold webbing over and sew, so that the tail cannot unweave through the buckle. 10) Lace the cord through the loops up the sides. Insert the cord locks, one for each side. Tye-off the cord using a double fisherman's knot. 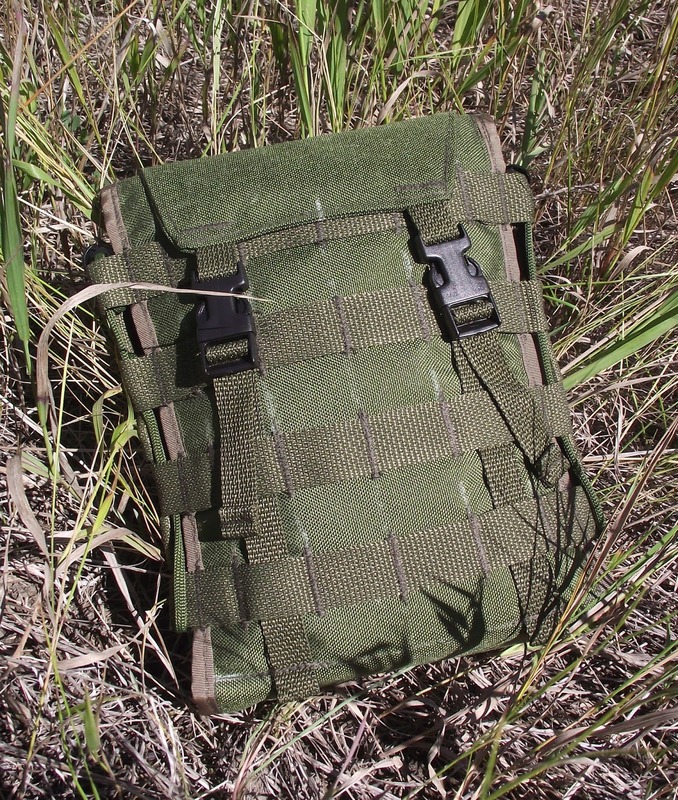 Tuck extra cord into the webbing on the rear MOLLE patch. Final tip: Use a flame/candle to melt all webbing ends, cord ends and seam tape ends; so, they will not fray and unravel. Get out there and use your gear!! PS - I cut a piece of polar fleece to keep the two solar panels from grinding into each other.